Mature performance: 90 percent of railway transport is already electric. And traction current increasingly comes from renewable sources. 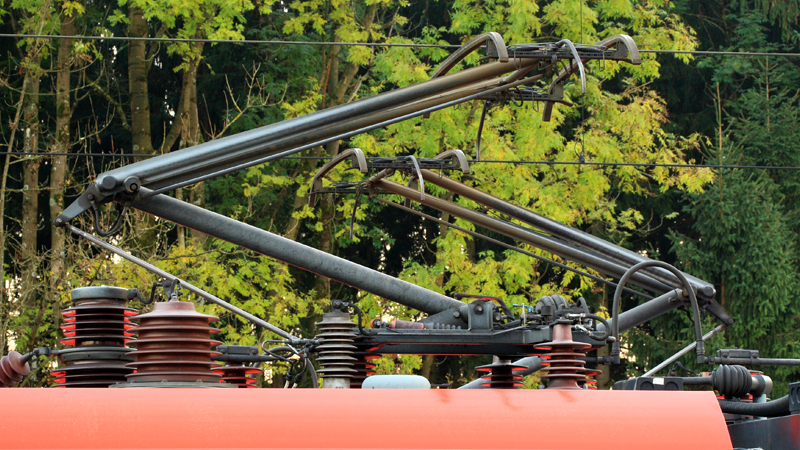 The railways’ share of green electricity is 42 percent, higher than the total in Germany. Berlin, September 14 2016. The future of transport belongs to green electricity. Whereas the high price and low range of electric cars mean that they are only just getting started, the railways have for years had a commanding lead when it comes to electrically powered transport. 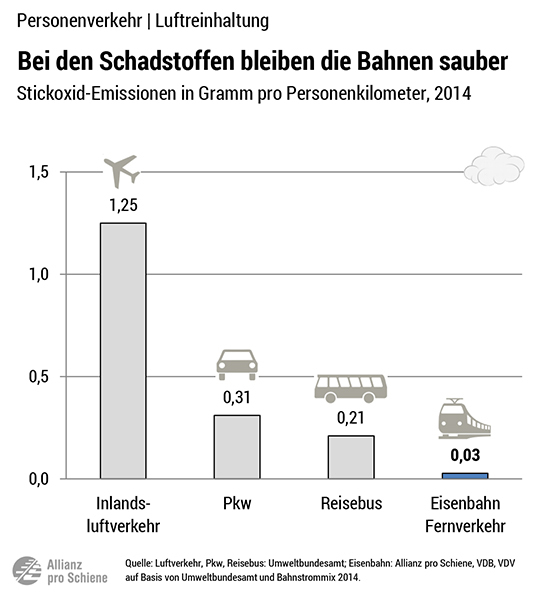 This is clearly shown in the latest comparison on environmental impact produced by the German Pro-Rail Alliance, the German Railway Industry Association (VDB) and the Association of German Transport Companies (VDV). In the run-up to the rail industry trade fair InnoTrans, the three major rail sector organisations have compiled a comparison of environmental impact for rail, road, waterways and aviation. It shows that the railways, for both freight and passengers, have a commanding lead over other modes of transport in the categories climate performance, energy consumption and air pollution. Neither heavy goods vehicles, nor aircraft or river barges can compare with the railways’ environmental performance. Even scheduled coach services, which promote themselves as the “green alternative to the railways”, lag considerably behind the railways in a direct comparison of CO2 emissions, energy consumption and pollutants. Only users of non-motorised forms of transport, cyclists and pedestrians have less impact on the environment. The latest environmental performance evaluation takes into account the effect of the increasing share of green electricity in the traction current mix. Against the background of future efforts to decarbonise the transport sector, the railways could play a key role in meeting climate targets, said the organisations, adding that politicians should take the climate’s top performer by its word. 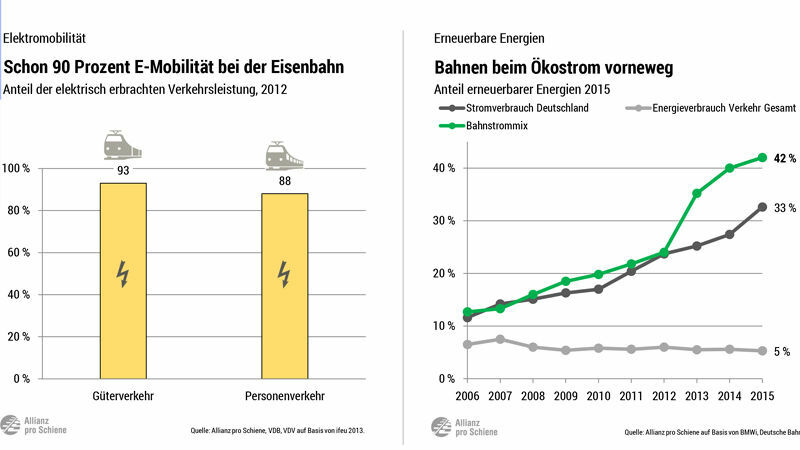 Chart left : 90% e-mobility on the railways (freight and passenger). Right: rail uses highest proportion of green electricity, followed by Germany overall and the transport sector as a whole. “The railways have now increased the share of electric traction to around 90 percent,” said the managing director of the German Pro-Rail Alliance, Dirk Flege, during the presentation of the environmental performance comparison on Wednesday in Berlin. Germany is going through an energy transition, and rail’s high proportion of green electricity now makes it a “leading sector”. “Intercity transport also made a significant contribution to the pleasingly high proportion of green electricity,” added Flege. In Germany, 42 percent of traction current comes from renewable sources, which means it carries the ‘green electricity’ label. By comparison, the share of renewables in the transport sector as a whole is a meagre five percent, and 33 percent of the overall electricity mix in Germany. “The railway sector is the undisputed climate Number One,” said the Pro-Rail Alliance manager. 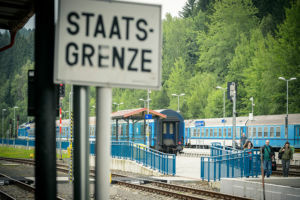 “Instead of only discussing electric cars, which are difficult to sell, Germany should be dismantling the competitive disadvantages facing its railways. 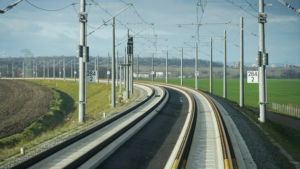 Reducing the tax on traction current is long overdue and something many European countries have already done.” In Germany, the environmentally friendly railways pay a share of the cost of the energy transition through the EEG green energy levies, which will increase again in 2017, “whereas car transport, the biggest cause of greenhouse gases, makes no contribution towards the energy transition,” criticised Flege. Chart shows nitrogen oxide emissions per passenger-kilometre. 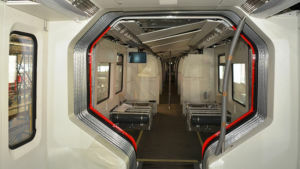 “Journeys on intercity trains are three times more climate friendly than on coaches,” said Martin Henke, managing director of railway transport at VDV, the Association of German Transport Companies. “For ecological and for economic reasons it is therefore essential that the different modes of transport can operate under fair competitive conditions. To date, companies operating coach services pay neither tolls nor station fees, in contrast with the railways. This unequal treatment disadvantages the railways, and politicians must deal with it as soon as possible,” continued Henke. 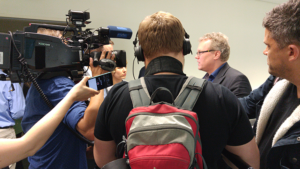 The VDV is also pushing for fair competitive conditions for freight transport. “It is once again the case that the most environmentally friendly mode of freight transport, namely the railways, suffers from a higher tax burden than heavy goods vehicles and inland river barges. If the government wants to hit its climate targets, then it cannot get around shifting freight transport onto the railways. For this, the rail sector needs reasonable and fair framework conditions. 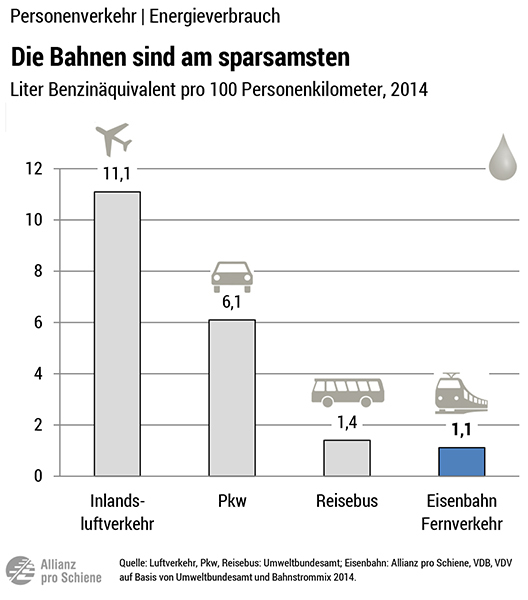 Chart shows energy consumption in litres (petrol equivalent) per 100 passenger-kilometres.